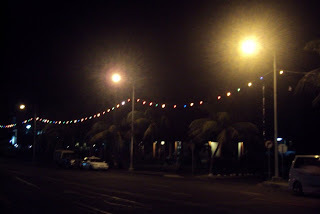 The lights along Beach Road are lit tonight on account of the holiday. They only light them 3 times a year: Independence Day, the Teuila Festival, and Christmas. The lights are very festive, and I personally think they should be turned on a lot more. But I guess I’ve got bigger fish to fry. Erin leaves tomorrow morning, and I leave the day after, and then Blakey will be the sole member of Group 81 in Samoa. Way to hold down the fort, Blakey! The plan to watch Christmas episodes from various TV shows is still on. On Wikipedia I found a stunningly comprehensive list of Christmas episodes of American TV shows, and using the Peace Corps library I was able to compile 18 episodes with a total run time of 9 hours. We’re all set. I finally got to what I think is the best episode of Mad Men last night where the priest breaks out the guitar at the end of the episode and plays Peter, Paul & Mary’s “Early in the Morning”. I admit I’m a sucker for musical montage. Which is why I’m looking forward to the “In Excelsis Deo” episode of The West Wing tomorrow. It turned out the correct answer was “the choir of angels”. Yeah, I think Linus may have actually said it better. But that’s just my opinion. I got a couple mosquito bites during mass tonight, and I realized I haven’t gotten any mosquito bites in a while. I’m not sure about this, but I think the weather lately has been too hot for mosquitoes. Just a hypothesis. Phil and I were cold the other night, and we were trying to estimate the temperature. We agreed it was probably high 70s Fahrenheit. It’s tradition here to go out to the nightclubs on Christmas Eve. According to one of my Samoan friends, Christmas Eve is very similar to New Year’s Eve. Asked if this was true in America, I shook my head. I won’t be clubbing tonight. Apologies to anyone offended by the language in Tuesday night’s post. I had to tell it like it happened. No punches pulled. I was at the flea market today looking for a particular souvenir in a particular colour, and when I finally found what I was looking for, the vendor wanted $15 for what should cost $10. 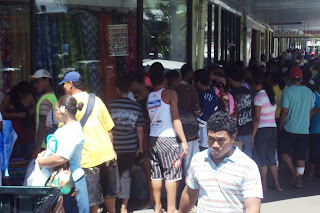 It’s faux pas to bargain in Samoa, but I called her out (in Samoan) on the price. Startled and entertained by my Samoan, she immediately agreed to the $10 price. See? My language skills aren’t terrible. I admit I’ve been keeping a secret from you, blog readers. It’s benign and inconsequentional, but I don’t plan on telling you until sometime in mid- to late January. Sit tight. Finally, I want to thank everyone who’s left Christmas greetings in the comments section. Season’s greetings to all readers. Have a wonderful holiday! That’s all I got for this week. I’ll give you a rundown on Christmas tomorrow night. I hope you’re well. Pictures below. 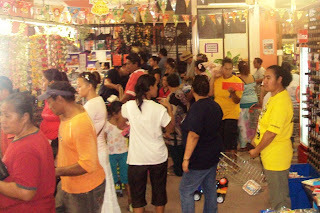 Last-minute shoppers—myself included—at Chan Mow, the Samoan equivalent of Target/Wal*Mart. The sidewalk outside Frankie's Supermarket this morning. Wishing you a very Merry Christmas Matt!! Thank you for writing such a great blog...you give me a break from my humdrum office job and an an update on my homeland altogether :) Thanks for all you do for the kids... They'll never forget the pisikoa that introduced them to the World Wide Web :) Thanks again and have a great holiday season!! Merry Christmas! Safe journey tomorrow. Can't wait to hear your stories of Australia. Merry Christmas Matt and Safe Holidays in Oz. Whilst in Sydney, you absolutely must go watch AVATAR in 3D at the IMAX cinema. You will not get another chance at it doing it again. This is the "Star Wars" of our generation, so it must be viewed right. I agree with anonymous. Sara/Cale and their retinue including myself went to see Avatar in 3-D at an IMAX and it was literally spellbinding. I can't imagine seeing it any other way. "Secret", "Benign" and "Inconsequential". Wonder what that is! 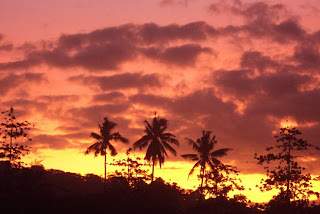 Thanks for showing us Samoa, I actually now know a lot about American Samoa(people, culture, life...) without ever having been there or meeting anyone from there ever.